Above: Course instructor Asa Stone conducts some research. Beer is a central part of society and an integral part of civilization—especially in New Mexico. But where did it come from? Call it a happy accident. Dating back to 7,000 B.C., the first brew was created in a region in central Asia, what we now call Iran, by accidental and spontaneous fermentation, meaning no cultured yeast or microbes were introduced to make the beer. It makes sense, because people didn’t know what yeast was way back when. “People knew that some sort of grain and water and some bittering agent, which would be used as a preservative, would help them to create this beverage,” said Albuquerque&apos;s Asa Stone, one of 100 certified beer experts in the world. Stone is the only Advanced Cicerone (basically a sommelier for beer) in New Mexico. 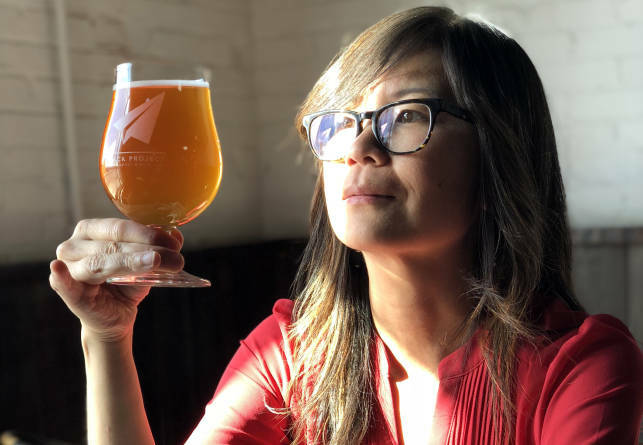 She is partnering with historian and beer enthusiast Brandon Morgan to teach “Beer and Society” at Central New Mexico Community College this fall, with hopes (and hops) that the class will connect students to the history of beer. “It is such an accessible and refreshing beverage, and [this class] would be such a nice way to elevate our experience,” Stone said. Some scientists say that recent archeological discoveries prove people started settling down as farmers and gave up their nomadic life because of the need to grow grain for beer, not bread. Stone said “during a time when water wasn’t necessarily the safest drink, the brewing processes of making beer actually saved a lot of people&apos;s lives” because water had to be boiled, nourishment added and then toxins filtered to create the beverage. Long before the industrial revolution brought the commercialization of beer, the drink was quite different in taste and in production process. People didn’t know that yeast was an integral part of converting fermentable sugar into alcohol, so beer often had a very sour taste, more akin to flavors we recognize in sauerkraut, Kimchi and even sourdough bread. Traditional Lambic brews (which are Stone’s favorite) are modern versions of spontaneous brews, because they are fermented by wild yeast and microbes found in the environment (like the air and wood) around them. Throughout CNM’s five-week course, students will travel through time and space through the lens of a frosty pint. Stone will whisk students away with guided tastings while Morgan brews tales of what is considered to be the world’s oldest beverage. Think about that next time you pop open a can at home or slide into the bar and order up your favorite brew. CNM students can sign up for the course for 1 credit. Those not enrolled at the university can also take the class. Sign up here.